The logic here, if you can call it that, is pretty strange. These are “our lands” so we should allow corporations to drill on them and make money for themselves and their shareholders? Sorry, New Englanders. All beaches will be closed for the next 28 years. 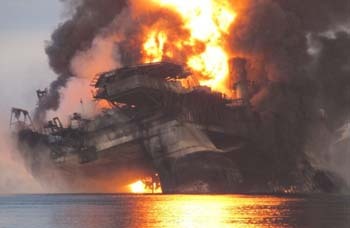 Some oil rig platforms have collapsed and there’s a widespread oil slick making its way to the shore. No problem New Englanders. The foreign owned Mega Oil Conglomerate said they’d help YOU pay for their cleanup. Photo – The massive 2010 Deepwater Horizon oil spill disaster – UK Telegraph. At the highest risk for the construction of new oil rigs, according to the Times story, is the eastern part of the already imperiled Gulf of Mexico, because of the infrastructure already present in the region. That should send a shiver up the spine of all anglers, since that’s home to the fish-rich Everglades and the Florida Keys. One must ask this question yet again: Where is Donald, Jr., in all of this? The self-proclaimed champion of America’s sportsmen—Jr. went to great lengths during the campaign to assure America’s sportsmen that he would be our guardian angel—has been utterly quiet on this issue, just as he has been on all issues affecting sportsmen. He’s had other things on his mind, for sure, but his silence on these issues has been deafening. In the end, this declaration from the administration is probably just saber rattling, as so many of the administration’s proclamations and announcements have been in the past year. . . . .
One thing is for sure: If you are an angler or you care about the places where much of our nation’s angling is done, it’s now time to sit up and pay attention now. Sign petitions. Call your local Congressmen and women. Stand behind the governors who are fighting this. Do this now, before talk becomes action.